He's been called a prophet, an innovator, a poet; whichever you prefer, the veteran emcee and Wu affiliate known as Killah Priest is certainly one of the most vivid lyricists in Hip Hop, with his lush imagery, graphic storytelling and razor-sharp rhymes. With ''Elizabeth (Introduction To The Psychic)''. 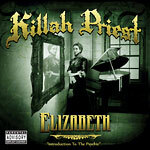 Priest delivers a solid full length of head nodders sure to satisfy Wu-Tang fans worldwide, while staying true to his spiritual side and his firm belief in the power of Hip Hop.